There is nothing more frustrating and time consuming then having to deal with a head full of tangled hair. Not only do you have to spend more time on your hair, you're also risking additional breakage as you detangle. 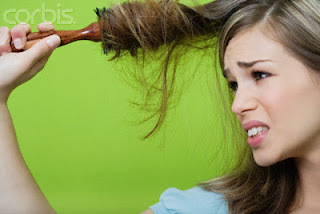 Here are some tips on how you can keep your tangles at bay. * You need the right tools and supplies. I probably have over 50 combs and brushes in my arsenal. Over the past several years I've been in search of a special comb or brush that I could use daily without the fear of causing more damage to my hair. I have a couple of favorites that I like. 1. Sally's has a bone comb set that I bought a few years ago. It comes with a bunch of various combs in all different sizes and for different functions. There is even a rat tail comb that I use when I rollerset. When I use these combs properly, I have no concerns that unnecessary breakage is happening because of the comb. The beauty of these combs is the smooth surface and seamless construction. I remember the days of old when I would comb my hair and find single broken hairs caught on the seams of the comb. Breakage is frustrating on its own, you don't want your comb getting a piece of the action. Another helpful piece of advice would be to finger comb your hair before runnning a comb through it. When you use your fingers, you can feel tangles much more easily and work them out with much more care than you would with a comb. Its one thing if your comb causes your hair to break, its a whole different feeling when you experience breakage from your own bare hands. *You need the right technique. All the fabulous combs in world won't help your hair if you aren't detangling properly. Whenever you are getting ready to detangle, you should begin with a mindset that the activity alone can possibly cause damage. Think of your hair as fragile strands of silk, better yet, think of your hair strands as being as fragile as a spider's web. You are the spider. You must carefully and gracefully navigate through your entire head of hair without disturbing the beautiful essence of it. In other words, don't just run a comb through your hair. 1. Section your hair. If your hair is as thick as mine, it can be overwhelming to detangle your entire head of hair. If you try to take it all on at once, your arms will inevitably become tired and your will take shortcuts just to finish. That's why I recommend sectioning. Sectioning your hair into four pig-tails should be enough but if you want to be even more careful, you can use smaller sections. The smaller the section, the easier it will be for you to locate snags and to carefully work them out of your hair. Sectioning just helps you to put things into perspective. You soon will learn the most difficult parts of your hair prone to matting when you detangle by section. Then you can carefully navigate through your hair without concern. If you tend to go a few days without combing, I recommend smaller sections. 2. Use short strokes. We've all heard that you should begin detangling a section of hair from the bottom up. I like and have used this technique. But for some reason, I have not been able to faithfully use it. If you can, more power to you because it works fabulously. I, on the other hand, have been using a different technique. I take a small section of hair maybe a couple of inches wide. I then take my trusty comb and carefully work it through my roots. Once I have loosened all of the shed hairs, I grab my roots with one hand and begin using very short strokes, with my other hand, to work the shed hairs down the length of my hair. As I move down with the comb, I also move my other hand further down so my hand is only a few inches away from the section I am combing. I never comb a section of hair from root to ends in one stroke. I am not running the comb down my hair, I am working the comb down my hair. There is a huge diffence between the two. I hope you get the idea of how I detangle. Trying to explain it in writing is a bit difficult. My method is essentially the inverted version of detangling from the ends up. When you do detangle from the bottom up, you use one hand to hold your hair about two inches from the ends then you begin to detangle that small section. Once that section is detangled then you move your hand an inch or two higher until you finally work up to the roots. Please remember that even though I detangle from the root down, I still work on one section at a time (1-2 inches). I NEVER run the comb down the entire length of my hair unless I have already detangled the entire section. The reason why I start from the root down is because my shed hairs tend to remain close to my root. The curly new growth easily winds around other hairs and begins to create a tangle. I found that when I started from the bottom up I would not get to the "root" of the problem until the very end. Whichever way works best for your hair, while causing as little breakage as possible, is the method you should use faithfully. *Lubricate-If your hair is dry, it will have a tendency to snap when you manipulate it while detangling. Always start to detangle by using your favorite oil or product on dry hair or leave-in conditioner on wet hair. Tangles are extremely frustrating when rollersetting. Keep a spray bottle of water handy. * Don't wait too long. I can't tell you how many times I have tried to save the length of my hair by bunning only to loose tons of hair in the detangling process several days later. Loosing up to 100 hairs a day through shedding is not uncommon. Those hairs, if not combed out, will likely end up latching on to other hairs. The longer you go without combing your hair, the bigger the headache later on. Even if you are protective styling, try to see if you can safely detangle your hair every so often. If you can perfect the way to detangle your hair with as little breakage as humanly possible, you'll be rewarded more length in the long run. -Here's to the health of your hair.